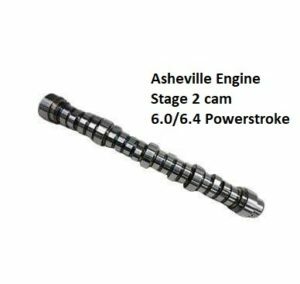 Stage 2 Camshaft Archives - Asheville Engine, Inc.
Asheville Engine, Inc., the leading independent Ford Powertstroke engine builder in the United States has three different Stage 2 camshaft offerings for the 6.0 and the 6.4 Powerstroke engines. Our own brand new custom built Billet Stage 2 camshaft lowers EGTs, spools the turbo quicker increases fuel efficiency. Because of it’s design, it also adds approximately 45 additional horsepower to a 6.0 and is much gentler on the valve train that a stock cam. We’ve installed approximately 800 of these camshafts over the past 6 years in our re-manufactured engines and every customer loves them. We sell our Asheville Engine Stage 2 cam for $800.00 which includes sales tax and shipping to anywhere in the continental U.S.
A step up from our own Stage 2 cam on a performance level is the Straub Technologies Stage 2 cam. This cam is very similar to the Asheville Engine Stage 2 but Straub Technologies changed the lobe separation to get a little bit more performance out of a Stage 2 cam. As a result, this cam is best for use in racing where a small percentage can make the difference between winning and coming in third. Asheville Engine retails this Straub Technologies Stage 2 cam for $995.00 shipped. Please visit the Asheville Engine web site and click on our products to see these and more great products from Asheville Engine, Inc.